Al Gharafa Doha (D1) tabbed 25-year old American forward Nick Stover (198-90kg-93, college: S.Alabama). He played in the summer at Denver in Eurobasket Summer League in Las Vegas1, which helped him to get the job in pro basketball. 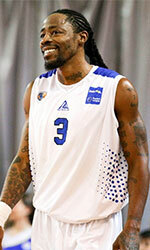 In 20 ESL games he was fourth best scorer with impressive 22.7ppg and recorded 7.0rpg and 3.8apg. The last season he played at Al Arabi where in 20 D1 games he was fourth best scorer with remarkable 22.7ppg and averaged 7.0rpg, 3.8apg and 1.1spg. Stover contributed to his team winning the league title despite they ended the regular season at the second place. He can count that season as a very successful as was awarded Asia-Basket.com All-Qatar D1 Forward of the Year, selected to 1st Team and selected to All-Imports Team. He graduated from University of South Alabama in 2017 and it will be his second season as a pro.